With better weather, I am trying to make up for lost time in the garden, too. Yesterday I planted some pansies in window boxes. 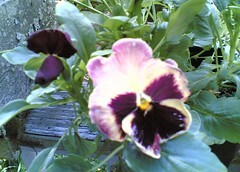 This pansy's "face" made me smile, so I took a picture with my phonecam. Tonight, I noticed some spilled potting soil creating a distraction in the background, so I opened the image in Painter and cleaned it up with digital pastel. Now that the weather has improved, we are making up for lost time. Here's a picture from a recent outing, the house at Long Hill Gardens. 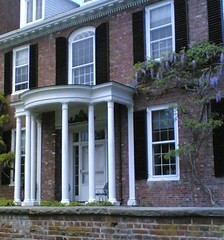 Around here, wisteria is in bloom and I especially like the way it looks against the brick. I took this photo with my phonecam, then cropped the image to get the composition I wanted. 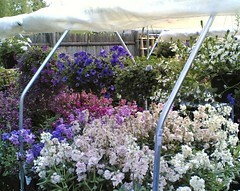 Here's another image from yesterday's trip to the garden store in Marblehead. I enjoyed seeing all these little rhododendron plants for sale, so I took a picture with my phonecam. Tonight, when I was getting ready to post it, I noticed a sales tag, so I opened the image in Painter IX and removed it with some cutting, pasting, and digital pastel. We went to the garden store in Marblehead this morning. It was beautiful there and I took a lot of pictures with my phonecam. I love to walk up and down the rows of stalls like this one. Tonight I cropped this picture for the sake of the composition, and then used Painter IX's digital pastel to eliminate two small but pesky signs that were distracting. I saw these columbines at a garden shop yesterday. They reminded me of Colorado, so I took some pictures with my phonecam. (Then I decided to buy three columbine plants for my garden.) 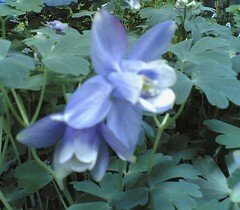 Tonight I cropped the image to focus on the blossom of the columbine. 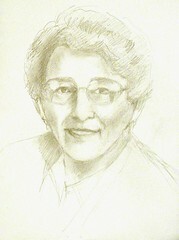 I will be starting to paint another portrait soon, but sometimes I like to start with a pencil sketch. It is a good way to "learn" the face, and it can be helpful even if (sometimes especially if) the face is familiar. It helps me to draw what I see, not what I think I know or remember. Here is the pencil sketch as it looks tonight. Time for another picture from Brazil. 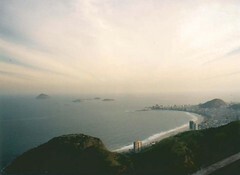 This is a view of the wonderful beaches of Rio, seen from the top of Pao de Acucar. This was taken during our long-awaited trip to Brasil in 1994. We had no sooner arrived than we were taken on this amazing adventure to the top of Pao de Acucar by suspended cable car. This is a happy memory of a trip that was worth the wait. Before the trip, I used to say, "I have never been to Brazil, but Brasil has come to me." And I am still very glad that it did. One of my cousins recently sent me a box of family photos, and I have been enjoying looking at them. Here is one that caught my eye. 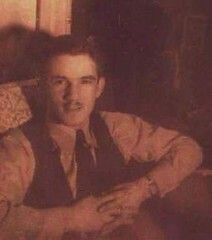 This is my dad (years before he became a father). Tonight I loaded the digital version of the photo into Painter IX and cleaned it up with digital scratch remover and in one or two places, some digital pastel. Then I cropped the image to improve the composition. 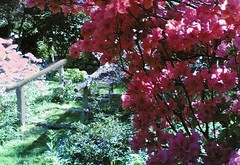 This is a digitally modified image of a photo I took recently at Long Hill Gardens in Beverly. We sometimes go to Long Hill with the dogs, for the exercise, and the flowers. You feel peaceful there after just five minutes, no matter how hectic or difficult the rest of the day has been. It's not easy to walk dogs and take photographs at the same time, so sometimes the results are not ideal. 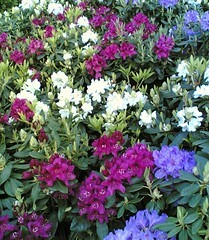 But I liked the azaleas and blue forget-me-nots , so I took a quick picture with my new phonecam. 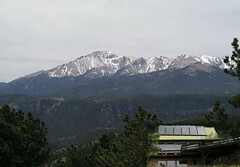 The resulting photo had potential, but also some problems. The foreground was fine, but some of the color in the background was washed out, making it hard to see the railings. Basic adjustments didn't seem to work. So I opened the image in Painter IX and used digital pastel to restore color where it was needed. Then I did a little digital pruning of an azalea branch that was blocking the view of part of the railing. Now the image looks more peaceful, and matches the way it feels to be in this beautiful garden. Mel and I drove in to Cambridge this morning, and we had great weather for it. 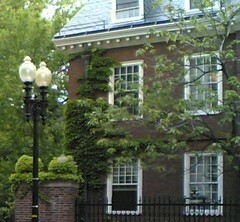 I took a picture with my phonecam as I was walking toward the Harvard Bookstore. Tonight I cropped the image to focus on the patterns of the windows and the spring green leaves. It has been such a rainy week, so it was great to get out this morning. We went to Long Hill Gardens with the dogs. There were lots of lilacs, and I like to get right up close so I can smell their perfume. 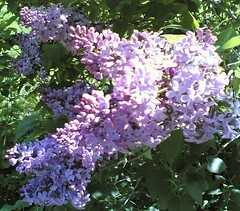 I like the way the lilacs looked in the bright morning sun, so I took this picture with my phonecam. Tonight I cropped the image just a bit to balance the composition. 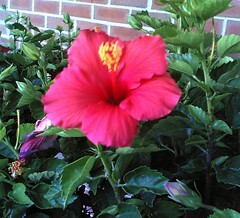 Today as I was heading into the grocery store, I saw hibiscus plants outside. I loved the color against the brick, so I stopped to take a picture with my phonecam. (Seeing hibiscus makes me smile because we used to have a big hibiscus tree which we called Junior and schlepped around the country when we moved.) Once I loaded the image into my computer, I cropped it to focus on the flower, and corrected the brightness to restore the color of the brick, which was too light and looked washed out. It is hard to ignore hibiscus, and I am glad that I didn't even try. This is a piece of digital art I have been working on, inspired by graphs and other mathematical illustrations. I am very interested in the idea that line carries meaning, whether in art or in math. I started this image about a month ago, but have had trouble finishing it. I started it by making some arcs in Painter IX, and then started filling in color with the digital airbrush. At first, I wanted hard, crisp lines. But with the cursor, which is what I use, it is very difficult to make precise lines that are curved or diagonal. Then I decided to soften the edges a bit, and I liked the effect. It also brings the piece a bit closer to what I have been thinking about, the intersection of art and math, and the blurred edges that divide the two fields. 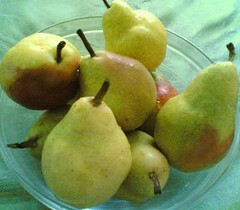 Yesterday I saw some beautiful pears, and I have to admit, I bought them because of their color! This is just the kind of thing I love to draw with pastels. I didn't have time to draw them last night, but decided to take a photograph before I set them out for dinner. Tonight I loaded the image into my computer. First I cropped it, trying to square the circle, and I liked the result. But although these are beautiful pears, still there were some distracting marks on them, and some of the color had been washed out by the flash. Even though I probably will use this image as the basis of a pastel or watercolor, I decided that I liked the photo well enough to try to improve it. 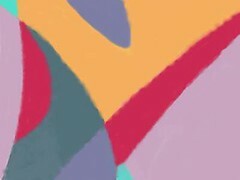 So I opened the image in Painter IX and used some digital pastel to clean up the image and adjust a few areas of color. Now the pears are even better. Mauro is visiting family back home in Rio de Janeiro. This is a photograph I took during our trip to Brazil in 1994. 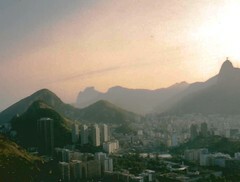 It is a view of Rio (including Corcovado) that I took during our unbelievable cable-car ride to the top of Pao de Acucar. It was an amazing first look at Rio on our very first day there! Tonight I scanned the image into the computer, adjusted the light and cropped it. Rio is certainly worth another look. This has been a very rainy week, with steady downpours, closed highways, and flooded basements. But there is better weather ahead, I am sure. Here is a photo that I took with my phonecam during a recent walk, before the recent string of rainy days began. 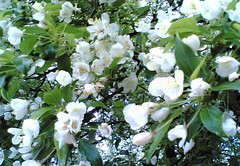 Tonight I cropped the image to focus on the sunlight hitting the little white blossoms. 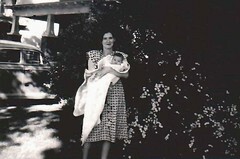 I was trying to find a photo of myself with my mother, but couldn't find too many. But I did find this one in an old album. Tonight I scanned it into the computer and cleaned up some scratches with Painter IX. Then I considered several ways to crop the image. I thought about eliminating the car, but I like the period feel and the dappled light on the lawn. I also considered cropping the opposite side, which was almost entirely dark in the original version. Instead, I decided to use Painter IX's tools to cut and paste the spirea that was visible in the photo, and put more of it in the dark area. Once I added more white flowers, I was happy with the composition, so didn't crop anything after all, not even the remaining shadow. And it is nice to find a way that I can still surround my mother with flowers on Mother's Day. 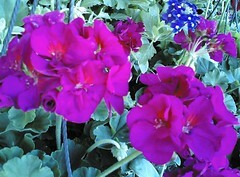 The other day, I used my phonecam to take a quick picture of the geraniums for sale in front of the grocery store. The color isn't quite naturalistic, even after I invoked "auto-adjust". I could have tweaked this to bring the color into a more naturalistic range, but given the run of rainy days we are having, I like the brightness of the image as you see it here. 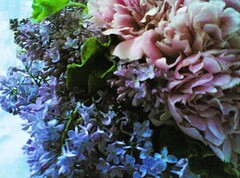 Today I received this bouquet of lilacs and peonies as an early Mother's Day gift. Lilacs remind me of the house where I grew up in Pueblo, Colorado, and peonies remind me of our house in Lawrence, Kansas. The arrangement is beautiful and I took some pictures with my new phonecam. When I loaded the images into my computer, I noticed that in the photo I liked best there was some background clutter in one corner. So I opened the image in Painter IX and neated it up with a little cutting, pasting, and digital pastel. 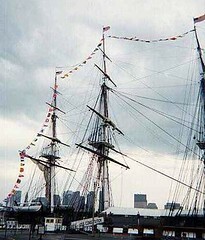 Several years ago, Heather and I decided to go see the tall ships when they came to Boston. To get there, we caught a water shuttle from the Charles Navy Yard. While we were waiting, we had a chance to look at the USS Constitution, and used it as a backdrop for souvenir photos of our adventure. But tonight I opened the photo in Painter IX and did a little bit of digital editing to get an image of the USS Constitution, because I think it is worth looking at for its own sake. 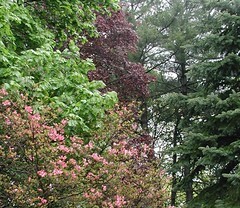 We have been having heavy downpours just as the trees are leafing out and blooming, so here is a photo to match the day. Tonight I cropped this image from a photo that I took with my digital camera around this time last year. Last year we were having a spring Nor'easter, just as the dogwood was blooming, like it is right now. It's hard to have cold, wet days just when trees are blooming, but we need the rain, and every once in a while, the sky brightens, and then the colors seem to glow like mad. This is a digitally modified version of a portrait that I painted for my friends. In February, I mailed the painting to them. 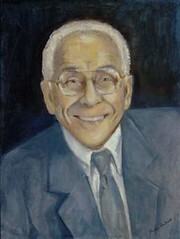 But I had the painting scanned before I sent it because my friends want to make copies for family. Scanning turned out to be a good idea because it gave me a chance to make a post-script modification, to soften a small area of shadow that turned out to be distracting. If I still lived down the block, I could have run over and fixed the problem in five minutes (and maybe I can still do that on my next trip home.) But meanwhile, I was able to use Adobe Photoshop to modify the digital image of the scanned portrait, and here it is. Does it matter that I made the changes digitally? To me, that is less important than making sure my friends are at peace when they look at the portrait. Whether I used paint or pixels, this image is the work of my hand, start to finish. 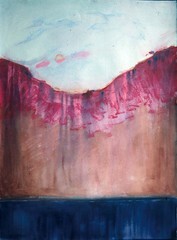 Here's another painting inspired by memories of the Colorado mountains. This painting was done with acrylics used as water media. Although this painting is from my imagination and is not an attempt to capture realistic detail, it is inspired by the colors found in the Colorado landscape and the proportions of sky, mountain, and horizon that you see when you drive through the mountains of my home state. Geraniums are on display at the grocery stores, which I take as a hopeful sign that it is going to stay warm enough to plant a garden without worrying about cold weather. (But then this is north of Boston, so nothing is certain.) 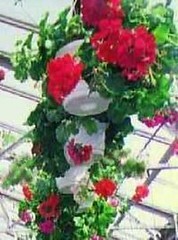 Several years ago, I took a picture of geraniums at a local greenhouse. Not too long ago, I cropped this closeup to focus on the patterns of the geraniums and of the roof. Tonight I came across this image, and wondered why I hadn't posted it. When I looked closely, I could see some distracting dried leaves in against the roof, so I opened the image in Painter IX and fixed it up with some digital gardening. Last night, Mel came home from the conference in Turin, Italy. I didn't get to make this trip, but I do have nice memories of Italy from the European trip we all made about ten years ago. 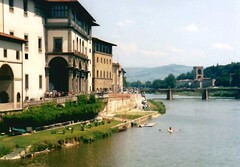 This picture, from my album, is a view of the Arno River, and was taken during our short stay in Florence. Today I scanned the image, then cropped it just a bit and corrected the color. Here's a nice memory from a trip to Mexico City in 1993. 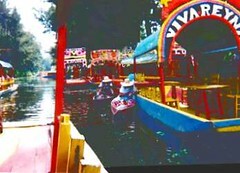 Heather and I went to Xochimilco to ride the beautiful flower boats. I recently came across this photo in my albums, so decided to post it today for Cinco de Mayo. I experimented with the contrast and the saturation, trying to find the best possible solution, given the bright reflections and dark shadows on the water. In this version, the color is slighly intensified to convey the vivid colors and the excitement of this adventure in Mexico. Why do I take pictures from the passenger seat of moving cars? I guess I get excited about what I see and don't want to miss any opportunities. I took this photo during my first trip to Portugal. Ordinarily, I would crop the photo to eliminate the dashboard and windshield wipers. 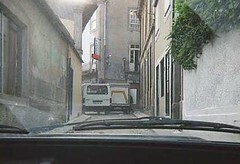 But in this case, I left enough of the dashboard and windshield wipers to put the viewer in the passenger seat, where I was when I took this photo, and convey a sense of the fun of driving down the narrow and winding old streets of the Foz in Porto. Yesterday Heather took a detour, and we were suddenly on a beautiful back road. 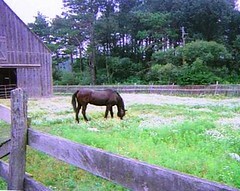 Although this area is known for the ocean, it is also horse country. Tonight I found a photo that I took at Russell's Orchard in Ipswich a few summers ago. The photo had potential, but needed a little work. I rotated it to get the vertical lines straight, then cropped the image to focus on the horse, and to line the roof up with one corner at the top of the picture, and the end of the fence with the bottom corner on the other side. Then I enhanced the saturation just a bit for contrast, and that brought out the beautiful color of the horse. 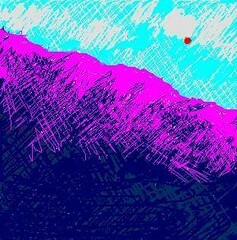 Today I used my recently rescued Clie handheld to sketch this image of the Colorado mountains. The image is from imagination and memory, but also is inspired by photos I have taken on trips back home. I have been trying out some new techniques with the Clie, using a thinner "brush" to make layers of color. After I loaded this image into my computer, I cleaned it up a bit with Painter IX's digital pastel, but one of the benefits of the technique I have been using is that I don't need to do as much cleaning up of the image. This is pretty much what the image looked like on the screen of my little Clie handheld. 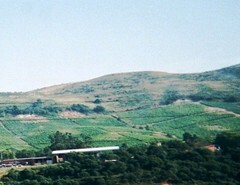 This is a photo from my trip to Portugal in July of 2001. I took this picture from the car as Mauro drove back to Porto from Lisbon. It is fun to drive through the countryside of Portugal and see the patterns in the landscape. Tonight I cropped the photo just a bit, and adjusted the contrast to restore the color.